Situated on a quiet cobbled street in the heart of SoHo, The Crosby Street Hotel is the perfect choice for those seeking fresh, contemporary digs in one of New York’s most vibrant neighborhoods. Though each of its 86 bedrooms and suites features floor-to-ceiling warehouse style windows, make sure you book on one of the upper floors if you’re looking to gaze out at lower Manhattan. In addition to The Crosby Bar, the hotel boasts a bevy of extras for guests, including: a private leafy garden, drawing room, fully equipped gym, luxurious 99-seat screening room, and several private event and meeting rooms. While every aspect of Crosby Street blends tastefulness with comfort, the rooftop bar—one of the more aesthetically pleasing spaces in the area—is perhaps it’s greatest asset. 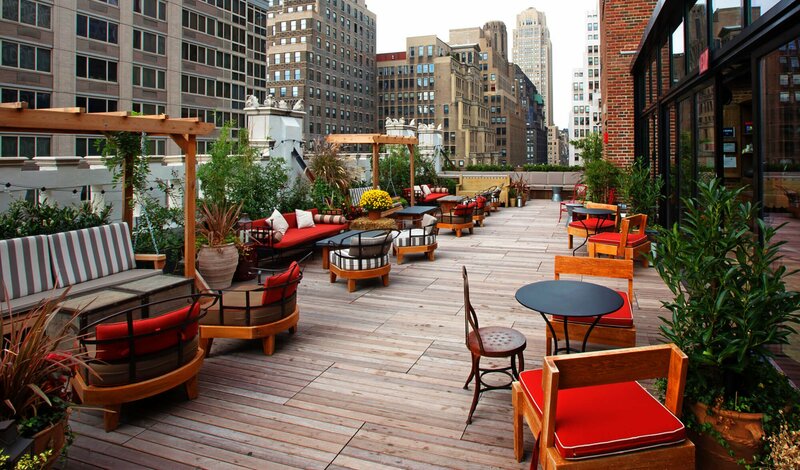 Unlike many other rooftop bars in New York, the CHS outdoor terrace (as it’s called by the hotel) is only eleven stories high. But what it lacks in panorama, it makes up for in cozy views of the surrounding neighborhood. You’ll feel as if you’re at a secret hideout tucked away in downtown Manhattan, which is as much rare as it is wonderful. What’s more, the rooftop is home to a beautifully appointed urban fruit and vegetable patch, which actually yields produce for some of their favorite menu items. In fact, the quality and freshness of everything served is guaranteed to make a big impression. We recommend the Croque Madame, followed up—of course—with the famous cinnamon sugar-coated Crosby doughnuts. And if you’re in the mood to change up your drink palate, try the hotel’s signature cocktail: The Tiger’s Eye mixes Stolichnaya, Champagne, lemon juice, star anise, pear puree and cinnamon. And no cosmopolitan hotel is complete these days (in our opinion) without a solid commitment to going green. LEED-certified, the hotel has two small but bountiful gardens for aesthetic serenity, terraces for outdoor dining and an outdoor sculpture garden for lounging. In addition to the small rooftop garden, the hotel’s main vegetable garden—designed by the Crosby Street’s Head Chef, Anthony Paris—supplies the on-site restaurant with melons, blueberries, tomatoes and herbs when in season. The hotel is also home to a chicken coop which shelters the four Araucana chickens who supply the kitchen with fresh eggs. Tres chic(ken). The third and latest iteration of the 1 Hotels lifestyle brand (with sister locations in Central Park and South Beach) 1 Brooklyn Bridge is pairing their core philosophy of melding eco-friendly design, sustainable architecture, philanthropic partnerships and superior service with the allure of East River panoramic views. Combining west coast chill with the thrill of the Big Apple? Hallelujah. It won’t take you long to see why this brand isn’t called 2. Upon arrival at 1 Brooklyn Bridge, you’ll be entranced by the lobby’s 25 foot green wall, compliments of landscape architecture firm Harrison Green. Comprised of steel grating adorned with hand-placed plants and ever-growing vines, this greenery might have you feeling more connected with Mother Nature than when you were standing outside. This lush display is contrasted by an industrial spiral staircase that climbs two stories and features an obsidian rock boulder sculpture. The man-made meets Earth-given vibe permeates the entire hotel and lends perfectly to the eco-luxe ambience. Such chic and yet functional surroundings were no coincidence, of course. According to founder Barry Sternlicht, the careful curation of every material and an overall focus on retaining the hotel’s purpose to both serve and inspire guests helped shape his vision for the space. 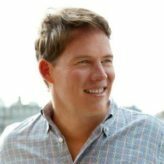 “Confronted with how far Americans were lagging behind in changing our consumption habits, I created 1 Hotels to show sophisticated travelers that they can do good, live well, and connect with both the world and the community around them,” said Sternlicht. From regional and reclaimed materials—the pine beams you’ll admire are from the former Domino Sugar Factory and the walnut comes straight from Brooklyn Botanical Gardens— to the property utilizing 100 percent wind power energy, to a rain-water reclamation system that irrigates Brooklyn Bridge Park during the summer, the eco strides are very real and noticeable. 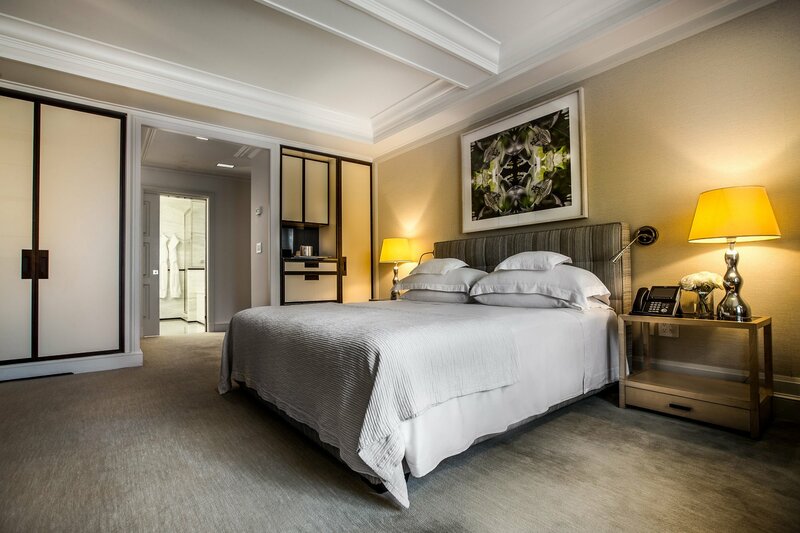 If your mind isn’t put to ease by the hotel’s eco-conscious efforts, it will find much needed rest and relaxation in its simple yet stunning guestrooms. The property boasts 194 of them, including 29 two- to six-bedroom suites and a 2,000-square-foot Presidential Suite dubbed The Riverhouse. No worries if you aren’t living the suite life—all rooms feature a sleek floor-to-ceiling sliding window with skyline views, tasteful leather and wood accents by local artisans, custom hemp-blend mattresses with 100 percent organic cotton sheets, and marble rain showers (timer included so you’ll get that gentle reminder to conserve). In-room yoga mats are provided, so feel free to turn on the LCD 55-inch smart television and flip to one of the on-demand meditation programs by brand Meditation Leader, Biet Simkin. Oh, and complimentary cozy socks are yours for the taking because they’re just good for the soul. 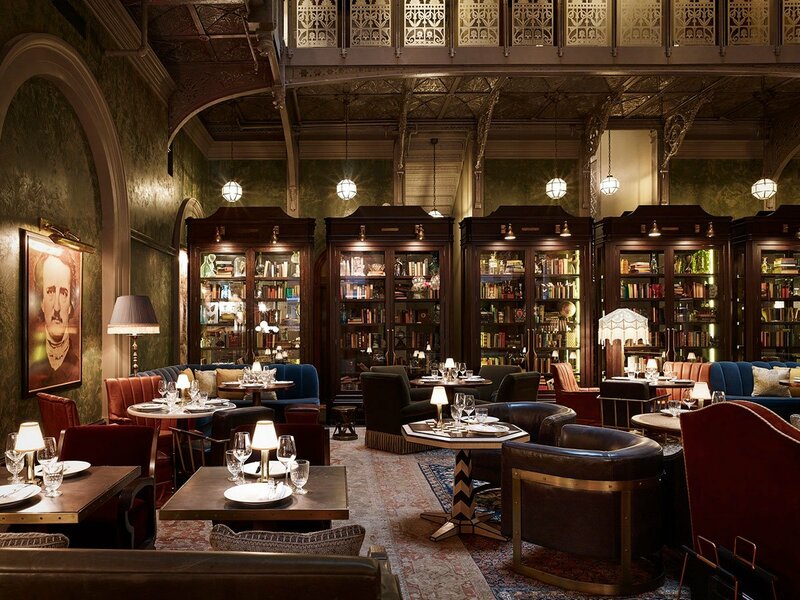 Elegant and upscale with a decidedly European feel, the NoMad Hotel—a design standout in it’s own right—is the crown jewel of the NoMad neighborhood. 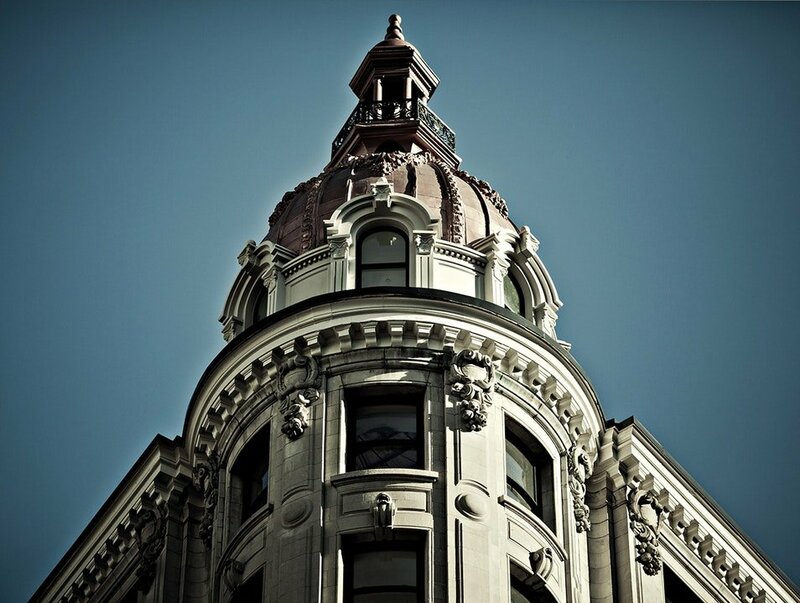 Housed in a turn-of-the-century Beaux Arts building with interiors by French designer Jacques Garcia and world-class dining and drinking from Daniel Hum and company (Eleven Madison), The Nomad has it all. The rooms are cozy but elegantly appointed, featuring large beds with studded leather headboards, velvet tapestries, antique Heriz rugs, and free-standing clawfoot bathtubs. Throw in a breathtaking private rooftop, a Maison Kitsuné and the occasional cocktailed magic show starring Dan White, and there’s little reason to even leave the premises. Perhaps our favorite feature? The fully curated, two-level library, connected by an original spiral staircase imported from the South of France. Guests can lounge throughout the day on custom-made furnishings and enjoy light fare and finger foods which are served alongside coffee, tea, wine and cocktails. 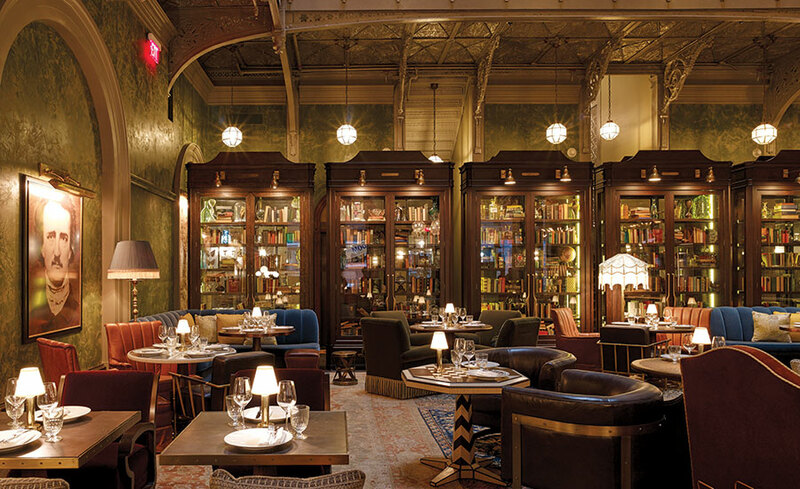 An eclectic literary collection is available, featuring extensive volumes on such wide-ranging topics as The History of New York, Music, and Cocktails and Spirits. And if you’re feeling famished you can order off the regular menu, which includes their signature chicken for two—a whole chicken stuffed with foie gras (plus one optional). Sure, travelers to the Big Apple have a cornucopia of gyms to choose from, but why spend your en perdiem bucks on a day pass? Located just a couple blocks from both Central Park and the Met in New York’s classy Upper East Side, The Mark is a luxury boutique hotel—and given the limited space, they take a smart approach with their gym. Rather than settle for a treadmill and some free weights, guests can schedule their workout with renowned fitness expert, Dan Flores, or opt for one-on-one personal training with kickboxing and MMA pros from Punch Fitness (owned by former national champ, Adelino DeCosta). Of course, The Mark wouldn’t make it on our list if all it had to offer was a good fitness center. The Mark is one of the chicest and prettiest hotels in New York. And because of it’s low-key, boutique feel on a rather quiet block between Madison and 5th Avenue on 77th Street, its popular among celebs and other well-heeled folk who prefer to trade the fast pace of lower Manhattan for the quieter and more old-fashioned elegance of the Upper East Side. Oh, and did we mention the Jean Georges restaurant? Every good workout calls for a little rest, relaxation, and refueling. An architectural gem hailed for its iconic nine-story atrium and pyramidal skylight, The Beekman unites some of the world’s greatest talent, including the sophisticated design of Martin Brudnizki and the culinary cachet of restaurateur and chef Tom Colicchio. This boutique hotel also features a restaurant by Keith McNally, his first in the neighborhood. Located within the center of Lower Manhattan’s “New Downtown,” nestled between both the East and Hudson Rivers, The Beekman is surrounded by some of Manhattan’s most cherished attractions—the Brooklyn Bridge, the World Trade Center, South Street Seaport and City Hall. The hotel boasts 287 fully appointed rooms (including 38 suites and two signature penthouses within its iconic “turrets”), each with private rooftop terraces overlooking One World Trade Center, the Woolworth Building and City Hall Park. The excellence extends far beyond the rooms and décor, though. Colicchio pulls inspiration from the rich history of the building and his own culinary journey to provide a menu of classics, old and new, reinvented with his signature seasonal touch. The a la carte and five-course tasting menu at Temple Court—a one-of-a-kind setting for dining set with rich, jewel-toned furnishings and antique accents—features dishes such as Maine Lobster with chanterelle mushrooms and tarragon, presented in the style of Lobster Thermidor. In the mood for something more casual? 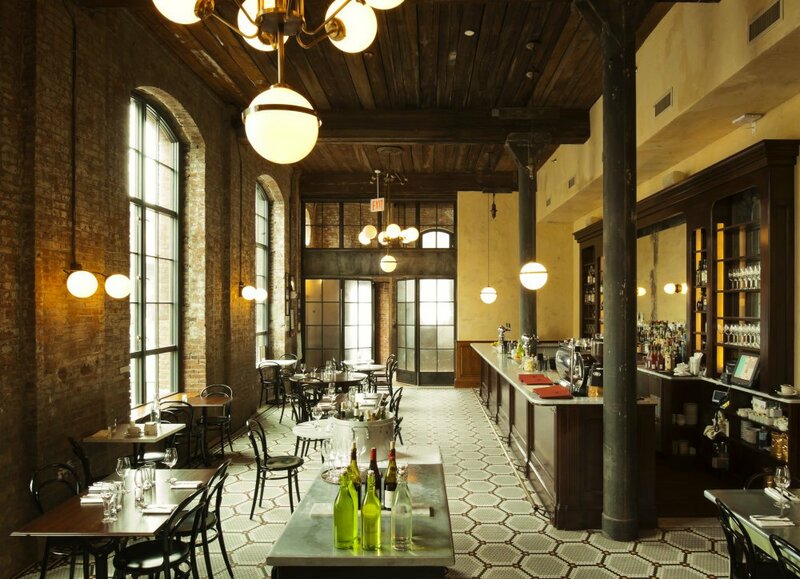 The Bar Room at Temple Court, with plush lounge seating and a distinctly old New York feel, is located beneath The Beekman’s stunning, nine-story Victorian era atrium and offers an ideal setting to enjoy a list of handcrafted cocktails alongside an all-day menu. The Beekman is undoubtedly one of New York’s best new hotels, but don’t just take our word for it. Since its soft opening in Fall 2016, The Beekman has received unprecedented acclaim and recognition worldwide: Condé Nast Traveler US’s 2017 “Hot List”, Travel & Leisure’s 2017 “It List”, USA Today’s “Reader’s Choice” Award, Food & Wine’s “Hotel Award”, and U.S. News & World Report’s “Best Hotel in New York” Award. The Highline may be at its most popular in the summertime, but this autumn’s favorable temperatures lend well to maintaining high traffic to its trendy surrounding neighborhood. And The Standard Highline just happens to rise up right above it. 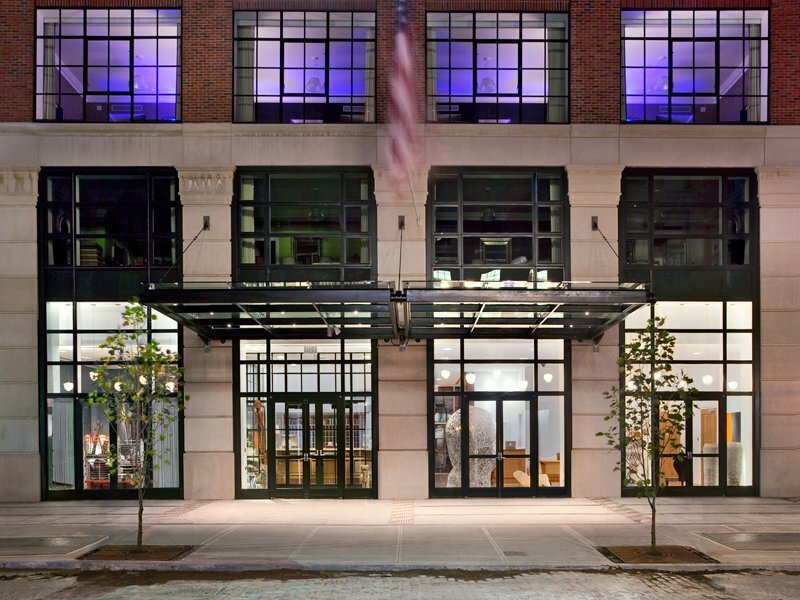 Situated in New York City’s very popular Meatpacking District, this hotel’s inviting public spaces are what make it a year-round favorite for travelers and locals, alike. At ground level, it has the young professional’s casual weekend haunt of choice, The Standard Biergarten. If you aren’t looking to lay low, you can reverse it straight up to the penthouse, where funky discothèque Le Bain hosts world famous DJs. Alternatively, if you’re feeling particularly fancy, the legendary Top of The Standard is the perfect spot for sunset drinks and appetizers. This sophisticated lounge will steal your breath with its views and quest your thirst with its specialty cocktails. For dinner (or brunch, if you prefer), there’s the award-winning Standard Grill, which melds a brasserie atmosphere with new American cuisine. When it comes to accommodations, think sleekly simple but still everything you may need. All rooms feature floor-to-ceiling, wall-to-wall windows that open to sweeping city or Hudson river views, and include amenities galore. The beds are adorned with sumptuous Italian sheets and fluffy down pillows, the bathrooms feature rain showers, the mini bars are overstocked, the cozy robes are extra large, and the room service is 24-7. Oh, and did we mention the hotel has its own ice rink? Bring the family back for a winter re-book. Once home to a Garment District hat factory, the Refinery Hotel maintains its industrial aesthetic and fashion heritage with an updated sense of luxury. The decor is sleek and modern, yet inviting and comfortable. The location is convenient, and just steps from Bryant Park. 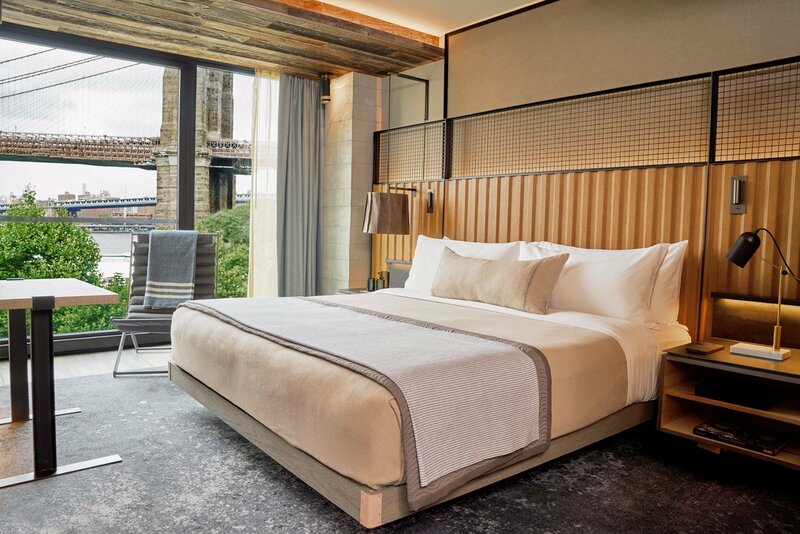 Drawing inspiration from their storied past, each of the spacious rooms at Refinery Hotel feature industrial accents such as 12-foot ceilings and distressed hardwood floors. While the 197 rooms call attention to the Colony Arcade’s early life as a hat factory, modern amenities like free WiFi, Noir bath products, and a mini bar stocked with Dean & DeLuca gourmet foods and local Hudson whiskey provide luxurious comforts. Serving breakfast, lunch, brunch, dinner and cocktails in a nostalgic atmosphere, Parker & Quinn, The Refinery’s main restaurant, features classic design touches from the building’s early life as a working factory. Executive Chef Jeff Haskell takes a straightforward and rustic approach in his kitchen, relying on high-quality and locally sourced ingredients to produce balanced, approachable American dishes. The Refinery Rooftop, however, is the crowning jewel of the space; a rooftop bar and lounge featuring over 3,500-square feet of cinematic views of the Manhattan skyline and Empire State Building. A cozy interior space is complete with fireplace, water feature, and wooden ceilings constructed out of wood salvaged from the original building’s water tank. An expansive indoor/outdoor space capped by a retractable glass roof, an outdoor terrace with porch swings, and spectacular city views from every direction make the Refinery Rooftop one of the most dynamic and tasteful (if not a bit lavish) rooftops in the city. Lunch menu favorites on the Rooftop include Seared Yellowfin Tuna, Grilled Hanger Steak Flatbread and the Little Gem Caesar salad with watermelon radish and frico. At night, lively crowds gathers for signature cocktails developed by In Good Company mixologists with a focus on natural ingredients paired in surprising and refreshing combinations. When the Wythe Hotel opened in 2012, it brought the city’s vibe with it. From the towncars and taxis pulling up at the corner to its bustling lobby, it feels more West Broadway than Wythe Avenue. 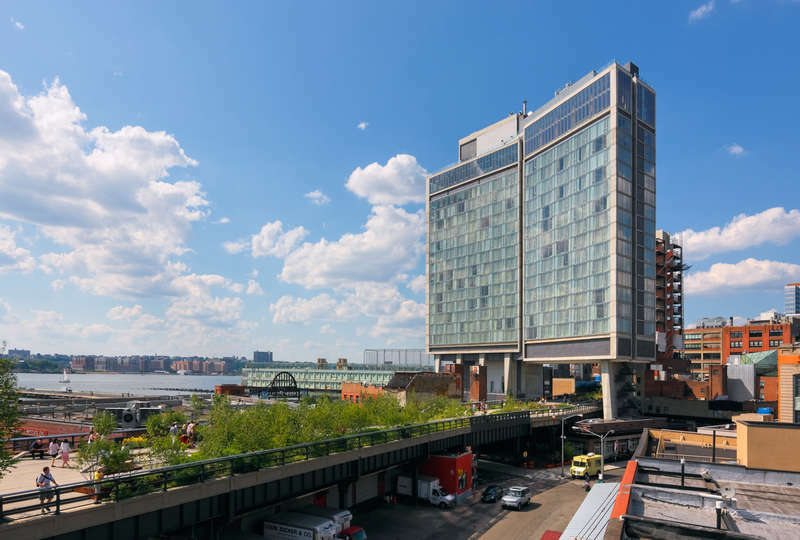 The 72-room hotel blends old and new; the building’s circa-1901 industrial details are offset with luxury amenities, floor-to-ceiling windows, and, in many rooms, outstanding Manhattan skyline views (another perk to being on the “wrong” side of the river). The Wythe Hotel’s restaurant, Reynard, is owned by the same group that first put Williamsburg on the culinary map over a decade ago with the opening of Diner. Their newest venture offers a daily-changing menu based on farm-to-table classics. During balmier months, The Ides rooftop bar feels like the Brooklyn version of the Standard Hotel Rooftop (but hey, it’s not that cold yet). This industrial-chic gem is across the bridge in Williamsburg, which might scare off some diehard Manhattan loyalists, but trust us when we tell you the city skyline views from your loft-style room will more than make up for a little extra travel time.